Soyuz TM19 – The landing capsule Soyuz TM-19 was used by the German astronaut Ulf Merbold to return to Earth on 4th November 1994 following his launch in Soyuz TM-20 on 3rd October 1994. Buran – The Soviet Space shuttle Buran was a the Soviet response to the American Space Shuttle. Two complete working vehicles were made. 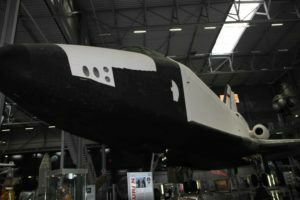 The Buran was unmanned and, although reusable, was never actually reused. One made a single flight to space and was later destroyed when the hangar housing it collapsed. The other made 25 test flights also unmanned but only in Earth atmosphere. Following an unexpected find in the Persian Gulf by German journalists, it was brought to Speyer in 2008. Bor-5 – To assist the Soviets’ design of the Buran they built and flew BOR-5 – a 1:8 scale model of the Buran. Bor-5 made five unmanned sub-orbital test flights between 1984 and 1988. Moon rock – One of the largest pieces of Moonrock I have seen on public display. It is from Apollo 15 mission but was unveiled at the Museum in June 2013 by Apollo 17 astronaut Gene Cernan. If you do go, it is is a big place – one day is not enough!